Traditionally not very common, the skirt steak seems to have grown in popularity over the past few years. It is a very interesting cut of meat, that is unlike the typical cuts served in steakhouses. You are more likely to see them served at Brazilian/Argentinian Churrascarias or Mexican places. It is not a particularly tender cut, but is very unique and flavorful. Because of the lack of tenderness compared to other cuts, marinating becomes very important as it helps keep the meat moisturized. Also, because skirt steaks are typically not as thick, it is easier for the marinate to impart flavor even to the inside of the steak. Tommy adapted this recipe from Alton Brown’s skirt steak recipe on the Food Network website. Some modifications were made due to lack of suggested ingredients/equipment. In a blender, put in olive oil, soy sauce, cilantro, garlic, vinegar, red pepper flakes, cumin, and sugar and puree. If a blender is not available, you can use a mortar and pestle to crush the ingredients, or even just finely chop everything. Pour the marinade over the steak. Allow steak to marinate for at least 1 hour in refrigerator, preferably 4-6 hours. Preheat a greased grill pan or heavy skillet under high heat until it is very hot. If you’re using cast iron cookware, this will take about 10-15 minutes. Before cooking steaks, make sure to remove the marinate thoroughly. 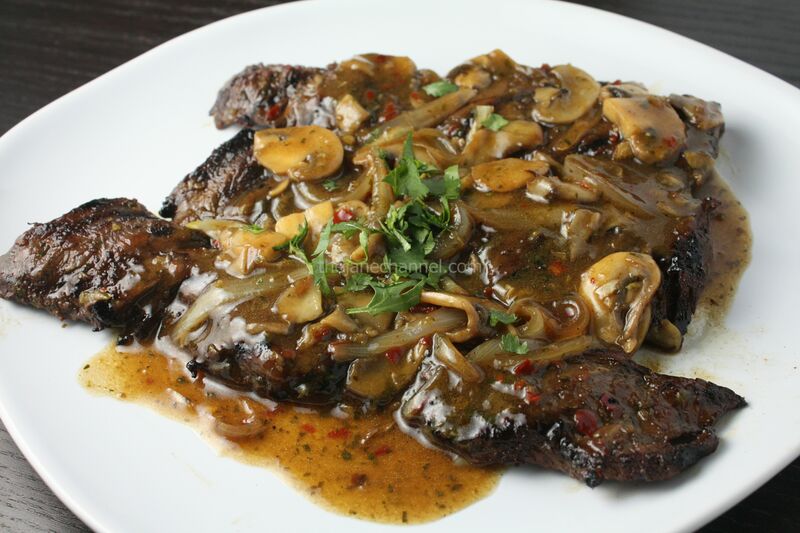 If any excess marinate is left on the steak, it will burn very quickly because of the sugar content in it. Set the marinate aside – we will be cooking it and using it as a sauce. Grill the steak until desired doneness, turning it over once during the process. How long this takes will depend on the thickness of the steaks, how well done you like them to be, and how long they have been out of the fridge. My steaks were pretty thin and were straight out of the fridge before cooking. I aimed for medium rare and cooking them 3 minutes on each side was almost right on. After cooking steaks, place on a plate and loosely cover with aluminum foil. Slice mushrooms and onions, and stir-fry both with a bit of oil under medium heat until almost cooked through. Add marinate and continue cooking for about 2 minutes, or until all contents are cooked through. Stir in the corn starch solution, by combining 2 tablespoons of water and 2 teaspoons, into the sauce. Cook under low heat until sauce thickens to your liking. Lastly, pour sauce over steaks and serve. Jane, you need to put a warning sign at your website that says “Enter with Caution If You Are Hungry”. I like Marinated Skirt Steak. nice meat. This is probably one of the best skirt steak recipes I’ve ever tried. Even the next day, it is juicy and flavorful! So delicious! Thank you for sharing, Jane!